Houzz.com is a website dedicated to home improvement and is an excellent source of visual photographs and inspiration for your next remodeling project. 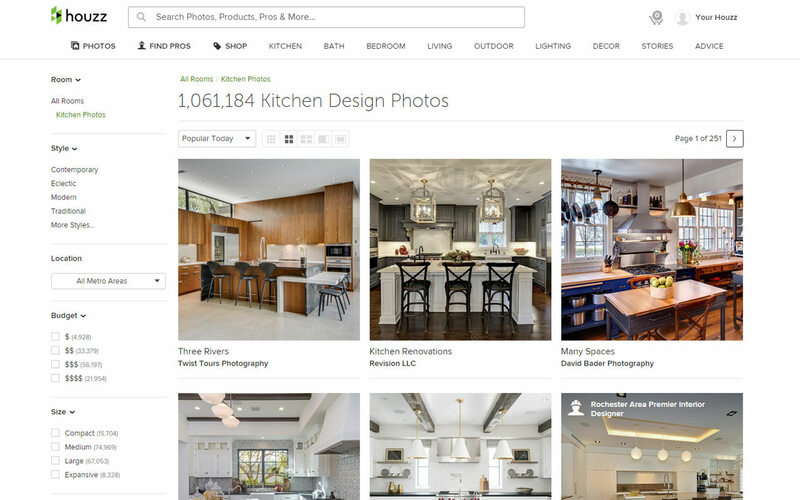 Houzz is the world’s largest professional image database of home interiors and exteriors with more than 2.5 million photos, according to Liza Hausman, VP of Community for Houzz. Pictures are worth a thousand words. You can use Houzz to create Ideabooks, or the virtual version of tearing images out of magazines, for your next project. Ideabooks can serve as a great visual guide of design choices for when you work with us. Not on Houzz? Here’s some quick steps for getting started. Sign-up on Houzz.com to create a profile and Ideabooks, make notes of what you like, dislike, and upload any photos of your own. Take advantage of over a million pictures available to you. The more specific the better when searching this database! Narrow your searches for faster and more specific results. You can add pictures to different Ideabooks by hovering your mouse over the picture and selecting “+Save” from the black bar that appears at the bottom of the photo. Create specific Ideabooks of different categories of your home, make notes of colors, likes and dislikes, etc. Here’s a visual tutorial via Houzz explaining how to use Ideabooks. You can find Stowe Construction on Houzz by clicking here or following the social icon on our website that directs to our profile. Houzz also has an app available for both Android and Apple devices to download. Download the app for iOS devices here. For more info, see our blog post on how to use the Houzz mobile app for planning your next renovation.